Mark Dawe, chief executive of national awarding body OCR, will set off on a 110-mile amateur race through the French Alps on Saturday (July 5). He spoke to Campus Round-Up guest editor Thomas Turnbull about training for the gruelling event and smashing his £2,000 fundraising target. Preparing to cycle up four mountains in a day is no easy task when you live in the flatlands of Cambridge. Mark Dawe, chief director of awarding body OCR, will set off on the La Marmotte race at 7am on Saturday and hopes to complete the 110-mile course in around nine hours. It will involve pedalling up four mountains — the Col du Glandon, Col du Telegraphe, Col du Galibier and Alpe d’Huez. He said: “I have enjoyed cycling for years, but never up four mountains in a day and Cambridge isn’t that hilly so it’s been quite hard to replicate. “It will definitely be a new experience which will involve climbing 16,500ft in total. Recently I’ve been doing three or four hour rides before work each week, getting up at 4.30am. I’ve been trying to get longer rides in at weekends and recently did a 125-mile ride. Mr Dawe’s training regime, for the event which will involve around 7,000 cyclists, also involved pilates classes to improve his flexibility and core strength. He said: “This challenge was the only thing that was going to get me out of bed early in the morning and force me to eat a pile of salad sacrificing my morning bacon roll. Mr Dawe is raising money through the cycle for Blue Smile, a children’s charity that helps children with mental health problems, and Stapleford Community Primary School, in Cambridge, where he is a governor. He allowed Cambridge Regional College level two and three beauty students to wax his legs on Friday (June 27) to celebrate passing his original £2,000 fundraising target. He is now hoping to increase that total significantly through auctioning a football signed by last season’s FA Cup-winning Arsenal team. Visit www.eepurl.com/XGYML to lodge a bid for the signed Arsenal football or https://mydonate.bt.com/fundraisers/markdawesride to sponsor Mr Dawe. 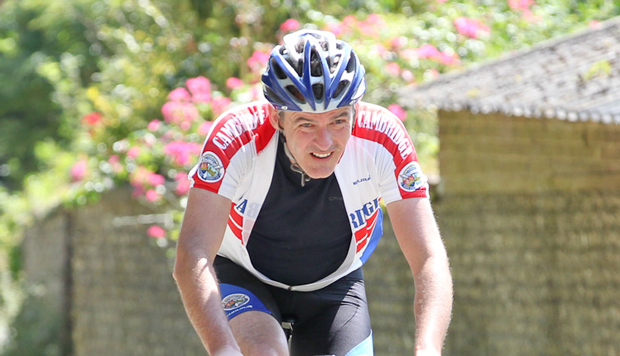 Cap: Mark Dawe takes part in the 125-mile Wiggle Long One race through West Sussex on June 21 in the build-up to the.